A difficult in and out trail that takes you from the Christopher Creek up to the Old Rim road (FR 300). Trail Description The See Canyon trailhead starts just before the parking lot on the right. From the trailhead, following the creek, the trail will take you on a level stroll through the pine forest and smaller prairies with high grass and wildflowers. You will eventually reach a T with the See Canyon trail going to the left and the See Spring off to the right up the hill. 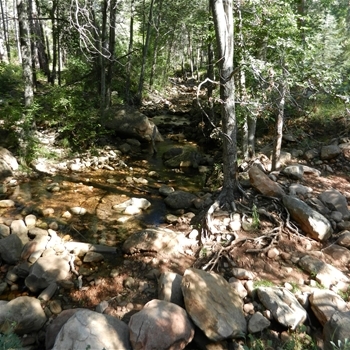 See Canyon Trail is one of the more adventurous hikes in the Rim Country. As one of the trails that goes up the Rim (like Highline trail), the See Canyon trail entertains with its colorful spread of wildflowers to luscious forest smells and the crossings of Christopher Creek. The first two miles make an easy hike with reasonable grades. Then the trail starts to climb...climbing toward Rim Road (FR 300), the forest gets thicker and the grade steeper (couple of quite steep and slippery slopes). Maples appear along the trail, as well as aspens, all contributing to the wild feel making it quite easy to get lost. Keep an eye out for trail signs!